So, Groom, you’ve decided that you are going to impress your fiancee by wearing a bowtie for your wedding, huh? She’s going to love it. You’ve also convinced all six of your groomsmen to sport one, too? How snazzy! When your beautiful bride sees you all for the first time, she’s going to be so surprised. In her wildest dreams, she never imagined that you guys could look so dashing. Like George Clooney. Or Daniel Craig, if she likes her leading men a little more rugged. Before you get to the dashing part, though, you have to pass through the operational gauntlet. But you’re a pretty smart guy. Look at who you’re marrying! You’re basically the smartest guy ever. You can tie a full windsor, half windsor, even a double windsor. How hard can a bowtie be? I mean, seriously, if I were you I wouldn’t even practice until the morning of the wedding. I’m sure your best man or one of your college friends knows how to tie a bowtie. And if not, there’s always YouTube! We don’t carry around those mini-computers we call phones for nothing! Forget the fact that you’re getting ready in a log cabin in the woods because your bride-to-be planned a rustic outdoorsy wedding and the 3G connection is rather spotty. You’ll be fine! Live a little, I say! The worst that can happen is that you all walk down the aisle with the tie slung around your necks like you’re just coming off an all-night black-tie rager. Your bride loves that look. I am (almost) absolutely sure of it. *The above message is an attempt at satire. At no point in the planning of a wedding should a groom decide to learn to tie a bowtie on the day he gets married. 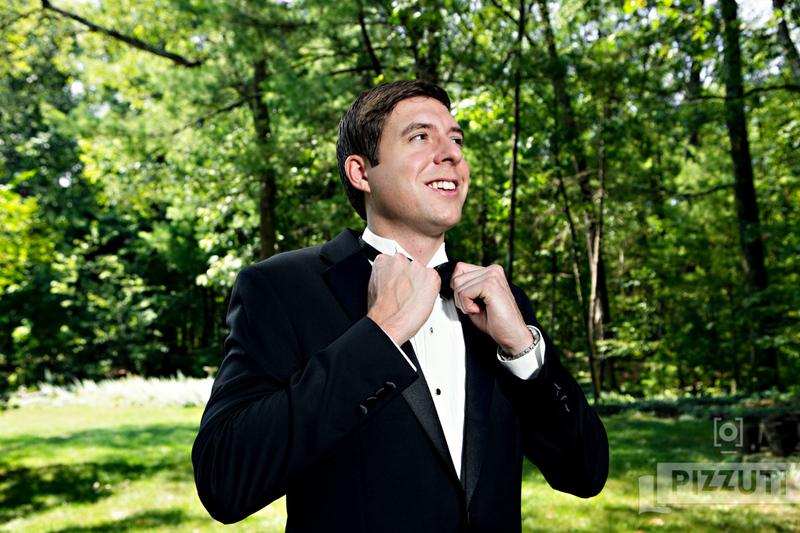 All grooms should familiarize themselves with their wedding day garb BEFORE the wedding day. Take the time to learn how to properly tie your neckwear. Figure out ahead of time what you want to do with, and how to fold, your pocket squares. And if you (or your groomsmen) are renting suits/tuxes, you should always unzip that bag and make sure you have all the pieces BEFORE you show up to get ready. Ideally, you’d even make sure everything came in the right size and fits. And that bag of little metal things that look like cufflinks? They’re button covers. Go figure.